It’s a long quote, I know, but a great dissection of a type of story-writing. This comes from the narrator of our story, a successful car salesman called Richard Hudson. The opening has Hudson watching a used Los Angeles car lot that he intends to buy. 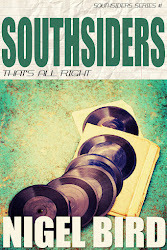 He analyses the pros and cons of the place with ruthless application and proceeds with his purchase for the business. It’s a classy, beautifully written beginning that really sucked me in completely. Like the quote above says, we have our sympathetic hero with whom we can identify. From there, we’re transported into an analysis of the art of story-telling in the film world. It’s a little unsettling, but it’s not long before the thread of the narrative is resumed. Essentially we have a tale being told in flashback. It’s a great way of grabbing attention and sows the seeds of tension because we know we’re heading for some kind of fall. Hudson moves back in with his eccentric mother and family. He spends a lot of time with his step-father, a genius of cinema who has lost his way. As they hang around together, Hudson realises that he needs something to fill the emptiness of his life and the creation of a film seems to be the obvious thing for him to do. He has an amazing knowledge of cinema and his step-father allows him an insight that many script-writers might die for. The creation of the film and the obsession of the writer are gripping. There are many occasions when I wanted to leap in and offer advice - after all, I know already that things aren’t set to end well. A huge amount of the book is absolutely brilliant. What lets it down a little is Hudson’s determination to do things his own way. He wants to do something that is out of the ordinary and he can’t bear the interference of the man at the top who wants control of the piece. His obsession turns into a kind of madness and in this madness lies his downfall. The problem for me here is that the book also works to its own calamity of an ending and for me Hudson had become so despicable that I didn’t care a hoot for him anymore. He was no longer my slightly flawed hero, but had turned himself into the villain of the piece. While I’m sure that was deliberate, there was something about it that felt a little disappointing. Maybe if I’d realised earlier what a toe-rag the man was (and there were plenty of serious clues, believe me), I might have read in a different way. Willeford certainly tells an incredible story with great flair and skill. The voice and the whole situation are brilliantly done. Because of that, I’m slightly disappointed in myself for not loving the entirety of the book to pieces. This one’s definitely worth a read and I’m sure will ignite a whole batch of questions for you as a reader. I’d love to hear a few opinions on this. Please feel free to share. 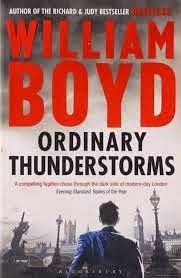 There are lots of William Boyd’s trademark themes in Ordinary Thunderstorms and the sentences are as dense as ever. Adam Kindred’s life is turned upside-down on the day he takes an interview for a prestigious post at Imperial College in his field of climatology. He bumps into a doctor who works in the field of medical research and when the doctor leaves behind a set of scientific documents relating Kindred does the right thing and does his best to return them. The next time Kindred sees the doctor, it’s in his apartment and he happens to be wearing a knife in the middle of his chest. Kindred removes the knife with fatal consequences and leaves the building, knowing that the file he’s carrying holds some great significance. There’s a Thirty-Nine Steps feel to this section and it’s expertly handled. The feel soon turns to something akin to Robinson Crusoe when Kindred is forced into hiding and chooses a small triangle of land on the banks of the Thames at Chelsea. From this triangle, he sets out on a new mission to survive the elements as well as to avoid the police who are looking for him and the murderers who want him dealt with. At this point the book changes pace and becomes a slowly unfolding adventure. 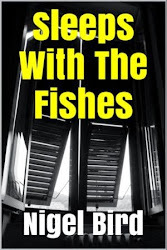 We visit a grim building estate, a fancy boardroom, the boat that is home to policewoman Rita Nashe and the brilliantly constructed Church Of John Christ. Each strand of the story is superbly written to form a substantial whole. Boyd seems to have so many ideas to explore that the book is jam-packed with interesting and original tangents. What this meant for me was that I felt the pace became a lot slower than I wanted, particularly when things were heading to their close. I cared enough and was curious enough about the characters to have a strong desire to find out their fates. On the final straight, however, I’d have been happier with more of a sprint finish than a help-me-get-to-the-finish-line struggle. I’d almost lost my appetite by the climax, which is a shame. A big fan of Mr Boyd’s books, I did enjoy this. Unlike the other books of his I’ve read, this one wasn’t quite a triumph. Freddy Otash is in purgatory. To earn a ticket out he needs to tell all. What follows is a list of sleazy Hollywood tales behind Otash’s Confidential magazine. 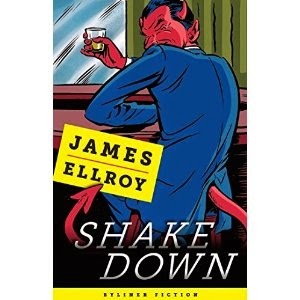 As well as encounters with the stars, Otash also meets up with James Ellroy to pass on his life story. The whole thing seems to have its tongue firmly in its cheek. Though there are some nice moments and a sprinkling of stunning phrases, there isn’t really a strong centre. It spins from low life act to exposé like a machine gun turret gone wild and because of this it never really finds traction. There’s also a very deliberate and slightly irritating alliteration that I could have done without entirely. It may well be that I missed the point of all this. That the book has a meaning or a subtext that I’ve not been able to grasp. For that reason, I’d suggest you read a range of reviews. That way, you might catch the opinions of someone who has the inside line on the jokes and references. Kate Horsley is clearly a brave lady. She’s taken on a master work and written a sequel. In doing so, she’s produced a novel of class and beauty that’s worthy of its recent nomination as Scottish Book Of The Year in the Saltire Literary Awards. Imagine, if you will, a small Scottish island at around the turn of the Nineteenth Century. It has a tiny population who are bound to the land and the sea for everything. Along comes the strange visitor from Europe and everything starts to change. Nature seems restless. Strange things have been washed up on the beach. Dolphins lay dead and smiling on the rocks. Livestock around the island is found ripped apart. Napoleon’s ships are moored nearby. It seems that God is angry and the people of Hoy gather in the church to pray and to swap tales. It’s not long before folk turn their attention to the mysterious Victor Frankenstein, who is living and working up at the big house, and to May and Oona who are working there for him. Oona is our guide and she’s a fabulously complex character. She has a rare strength and determination about her and yet has a physical frailty that softens and yet heightens these traits. She shows a tremendous loyalty to her best friend, May, who is about to leave her to marry a twin from the village. It’s this loyalty to May that initially draws Oona in to the life of Frankenstein. It’s a mysterious world that she enters and the complex layers are peeled slowly and tantalisingly away as we get to discover this new world through Oona’s eyes. The world of the big house is a stark contrast to the superstitious, God-fearing community who talk of the bible, the selkies and the Finman. It’s a practical, scientific place full of caged birds, home-made contraptions and experiments aimed at discovering something of the nature of death and exploring the possibilities of resurrection. It’s a stroke of genius to tell the story from Oona’s perspective. It works to the book’s advantage at every turn. What is so stunning about the book for me is the use of language. The work flows from one gem of a sentence to another. The dialogue captures something of a sense of period, is clean and never stilted in the way that some attempts at historical fiction can be. The shadows and sense of darkness are embedded into the work with great subtlety and the images are often so perfectly honed that they really can take the breath away. The characters, and I’ll include the island of Hoy here, are wonderful. Their differences are exploited superbly when things start to go wrong and the status quo cracks like dry bones. On top of all that, the novel is incredibly gripping. The tension builds and the sense of the sinister grows in the way of any great page-turner. 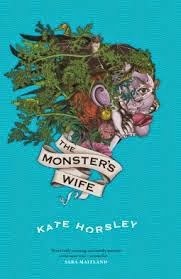 I found The Monster’s Wife to be a terrific read. It’s a stunning work and I hope you’ll take the time to check it out. If you happen to be in a book group, I’d suggest you make this your next recommendation. You’ll get so many hours of discussion and so many pats on the back from the other members for the idea that you really won’t regret it. 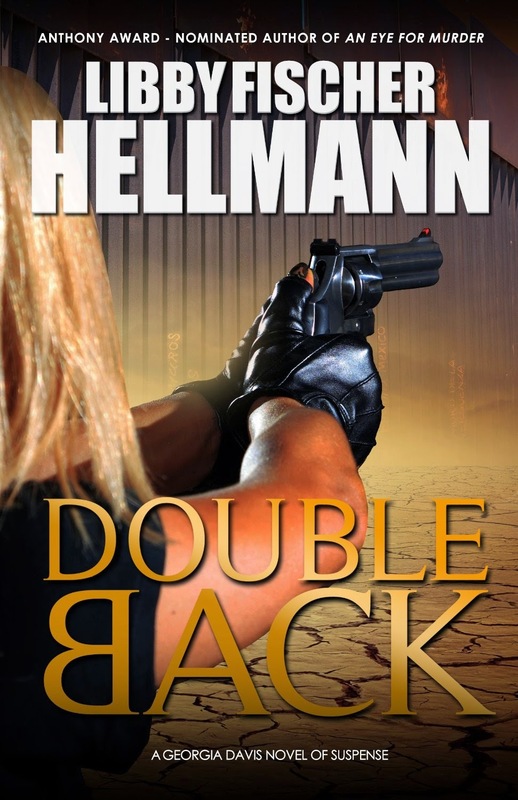 Doubleback is a soft-boiled detective novel that mixes gentle encounters with urgent action scenes to provide a well-rounded story. Georgia Davis is sucked into a kidnapping case involving a young girl and overcomes her reluctance to investigate when a number of fatal accidents have more than a whiff of the sinister about them. As she probes, she collects the pieces of the puzzle she is looking to solve, each of them being bigger than the one before. 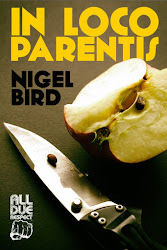 She covers a whole range of dark goings on including those in the world of computers, banking, pirate security forces, drugs and immigration. That’s a lot of territory, but each step makes sense and the complexities of the issues are well-explained where necessary. It’s a pleasing read with a satisfying ending and Georgia and her supporting cast were a pleasure to get to know. I’m not entirely sure how George Pelecanos does it. Drama City is yet another example of the man’s brilliance. He tells a huge number of stories all at once by weaving together the lives of the main players with those of the supporting cast and still manages to drive forward a central theme that never lets on about where it’s going until things reach their climax. Lorenzo has a probation officer, Rachel Lopez, and she (like me) is rooting for him all the way. Lopez invests a good deal into each of the offenders she works with, believing in the possible. Unfortunately, she’s fighting demons of her own. Like Lorenzo, her job leads her into many difficult and dangerous places and her ways of coping are easily understandable. For me, the power of Drama City lies in the strength of the characters. 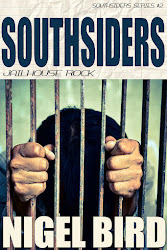 From an early stage I felt a strong desire to see them come through their own personal battles unscathed. Once that desire had been established, Pelacanos began to play with the inhabitants of the book like a mischievous god, throwing them to the lions piece by piece and forcing me to watch as the situations played out. Pelecanos also manages to summarise the profound using very simple brushstrokes and is able to impart huge amounts of information through the tiniest of things (take, for example, the provenance of a matchbook). 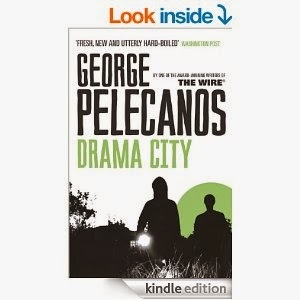 Drama City is a hugely satisfying read. The only way I could recommend it more highly would be to stand on something very tall. Be warned, it’s not for those of a nervous disposition. At the opening of Incident On And Off A Mountain Road, a car is driving too fast around a bend and takes out an old Buick. Ellen stops to check for survivors. She finds blood on the seat and then is attacked by a deranged character wielding a knife. 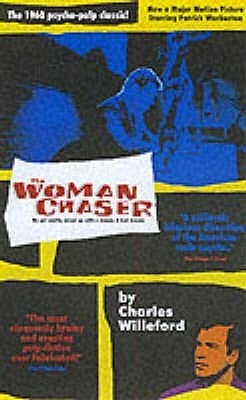 What follows is a chase that sees Ellen doing her best to get away. Thankfully, she’s been hooked up with a trainer in survival techniques and his voice pops into her head every-so-often to help her stay clear of the lunatic with the blade. As Ellen wanders further into unknown territory, she discovers that her attacker is even more loopy than she could ever have imagined. The tension builds fairly well for a short piece and the horror elements work nicely. 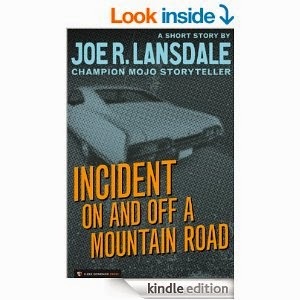 It’s not my favourite Lansdale by a long shot, but it’s an interesting enough read. It also happens to include one of the most horrific weapons I’ve come across and a nice twist at the end to tie things all together.